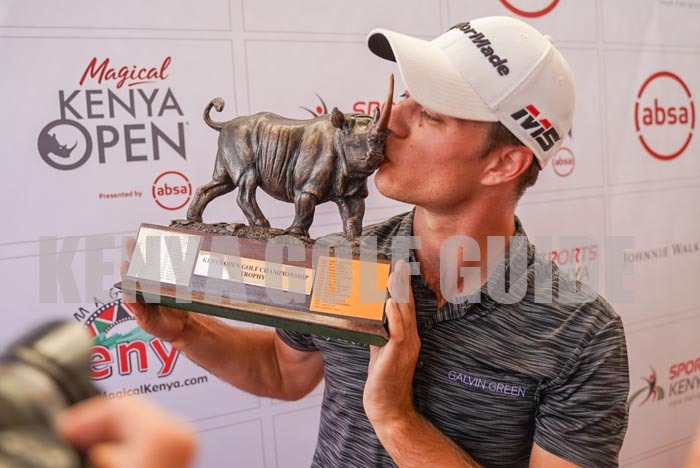 Italian Guido Migliozzi kises the Magical Kenya Open Golf Championship trophy after he was crowned champion at the tournament. Twenty two year old Italian professional golfer, Guido Migliozzi is the 2019 Magical Kenya Open winner. Migliozzi claimed the 2019 title after returning a score of 2 under par, 69 for round four to take his overall score to 14-under par 268. “I enjoyed the last two days very much. The pressure was a lot and I’m happy about how I have played under pressure, also with my putting game that I worked a lot on. There was a lot of pressure on the course, obviously. After the birdie at the 12th I was leading but it was tough. I just kept patient towards the end, that was it.” He said. 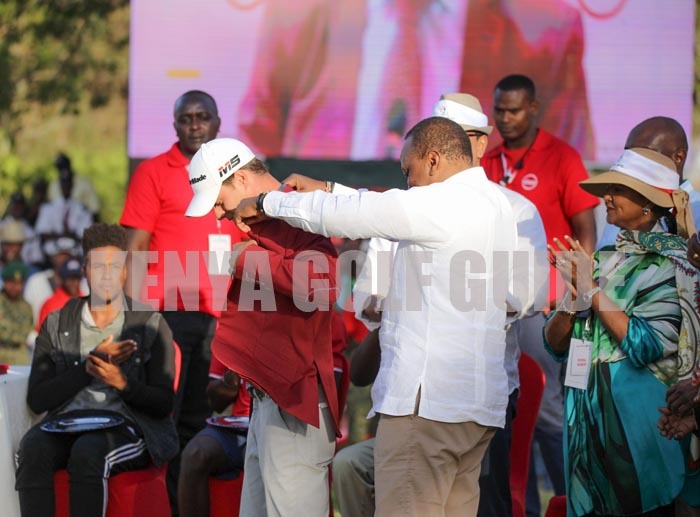 President Uhuru Kenyatta helps Guido Migliozzi wear the 2019 Magical Kenya Open Golf Championship winner’s jacket after the Italian was crowned champion at the tournament. “Yesterday I went to the left at the 18th with a two iron, today I went with a four iron, just to be sure that I don’t go left and I had the perfect distance for an eight iron, it was really nice. Easy two putts to win.” He said. Adri Arnaus, alongside South African duo of Justin Harding and Louis De Jager had to settle for joint second, a shot behind Migliozzi, on a score of 15-under par, 269. India’s Bhullar Gaganjeet finished a further shot behind on 14-over for a fifth place finish. Kenya’s Simon Ngige finished as the best placed Kenyan, after playing a round of 2-under par on the day to take his total to 5-under par, 279, to see him tied for 25th, alongside the 2016 Kenya Open winner Sebastian Soderberg. The other Kenyan to have made the cut, Justus Madoya finished tied for 72nd, with an overall score of 5 over par, 289. Meanwhile Scotland’s Robert Macintyre, shot an impressive round of 8-under par, 63, the best of the tournament, placing him tied for 17th on an overall score of 7-under par, 277. The 2018 winning Ryder Cup captain Thomas Bjorn, was tied for 12th place on an overall score of 8-under par. This entry was posted on Monday, March 18th, 2019 at 11:34 AM and is filed under Golf News. You can follow any responses to this entry through the RSS 2.0 feed. Both comments and pings are currently closed.